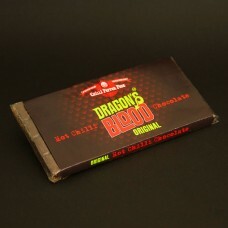 Dragon's Blood Original Chilli Chocolate Bar - chocolate with fire! Info: You've had the cult classic Dragon's Blood in a bottle, well now try Dragon's Blood in a bar. 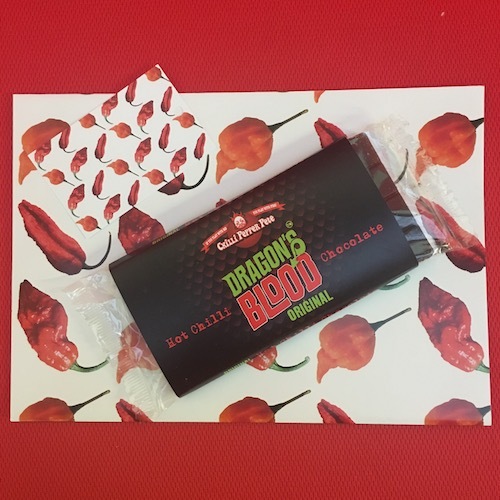 We've taken the heat of the Naga Ghost Chilli and the pineapple fruitiness from the Dragon's Blood Original Mega Hot Sauce and put it in a bar of lusicious dark chocolate. One bite and you're hooked! Suitable for vegans too.